The "W" shaped control yoke of a Boeing 737. Note the checklists for before takeoff to landing in the middle. Collection of control yokes at Boeing Future of Flight Museum: 747, 707, B-29, Trimotor. The former two yokes are "W" shaped, while the latter two are circular. 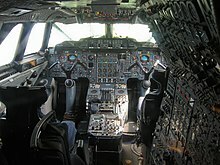 The cockpit of Concorde, which has an "M"-shaped yoke mounted on a control column. 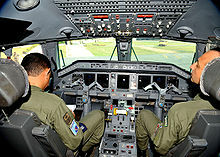 The cockpit of an Embraer ERJ with an "M"-shaped yoke. "W"/"U" style yoke in a Cessna 152 light aircraft, mounted on a horizontal tube protruding from the instrumental panel. Circular, steering-wheel type yoke in a 1940s Lisunov Li-2. Cirrus SR22 panel showing both side yokes. Cessna 162 Skycatcher Instrument panel. A yoke, alternatively known as a control wheel is a device used for piloting some fixed-wing aircraft. The pilot uses the yoke to control the attitude of the plane, usually in both pitch and roll. Rotating the control wheel controls the ailerons and the roll axis. Fore and aft movement of the control column controls the elevator and the pitch axis. When the yoke is pulled back the nose of the aircraft rises. When the yoke is pushed forward the nose is lowered. When the yoke is turned left the plane rolls to the left and when it is turned to the right the plane rolls to the right. Small to medium-size aircraft, usually limited to propeller driven, feature a mechanical system whereby the yoke is connected directly to the control surfaces with cables and rods. Human muscle power alone is not enough for larger and more powerful aircraft, so hydraulic systems are used, in which yoke movements control hydraulic valves and actuators. In more modern aircraft, inputs may first be sent to a fly-by-wire system, which then sends a corresponding signal to actuators attached to the control surfaces. Yokes may feature a stick shaker, which is designed to help indicate the onset of stall, or even a stick pusher, which assists in stall recovery. Yokes come in a variety of shapes and sizes, the most common being of a "U" or "W" design. Some aircraft use an "M" style, such as Embraer aircraft and the Concorde. There are some rarer exotic or archaic styles, such as circular designs much like a steering wheel. In larger aircraft they are usually mounted on a post protruding vertically from the floor, referred to as a control column. In most other planes, they are mounted on a horizontal tube that comes out of the instrument panel. In the case of the Cirrus SR20 and Cirrus SR22, although the control looks like a side stick, it works like a yoke handle (referred to in the industry as a "side yoke"). The Cessna 162 uses a slightly similar approach. Side-sticks and centre-sticks are better for making rapid control inputs and dealing with high g-forces, hence their use in military, sport, and aerobatic aircraft. However, yokes are less sensitive (i.e., more precise) thanks to a larger range of motion and provide more visual feedback to the pilot. Most yokes are connected and will both move together, thus providing instant indication to the other pilot when one makes a control input. This is in contrast to some fly-by-wire control sticks that allow each pilot to send different, and sometimes greatly conflicting, inputs though competing inputs are signaled on Airbus FBW craft. Yokes take up more room than side-sticks in the cockpit, and may even obscure some instruments; by comparison, side-sticks have minimal cockpit intrusion, allowing for the inclusion of retractable tray-tables and making it easier to enter/leave small cockpits. A yoke, unlike a side-stick, may be used comfortably with either hand. This can be useful if one needs to write or manipulate other controls in the cockpit. This advantage is shared with the centre-stick. 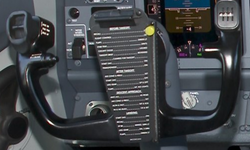 The yoke often incorporates other key functions such as housing thumb or finger buttons to enable the radio microphone, disengage the autopilot, and trim the aircraft. In addition, there may be a clipboard, checklist, or chronometer located in the yoke's centre. Yokes are not used on all aircraft. Helicopters use a cyclic and the majority of military fighter aircraft use a centre or side-stick. Some light aircraft use a stick because some sport pilots prefer that control system. The latest Airbus family of passenger jets use a side-stick, not unlike a joystick, to actuate control surfaces. There are also computer input devices designed to simulate a yoke, intended for flight simulators. ^ "10 Ways that the SR22 Changed Flying". Flying Magazine. Retrieved 2018-03-13. ^ "Detailed Comparison of the Cessna TTx and Cirrus SR22T G5 | High Performance Aviation, LLC". High Performance Aviation. Retrieved 2018-03-13. ^ "Flight Test: G5 Cirrus SR22T". Pilot. Retrieved 2018-03-13. ^ Larson, George C. "A Flight In A Skycatcher". Air & Space Magazine. Retrieved 2018-05-19. ^ "Aircraft Spotlight: The Cessna 162 Skycatcher - A Modern, Cost Effective Trainer". www.aopa.org. 2017-11-19. Retrieved 2018-05-19. ^ a b Mc Clellan, J. Mac (May 2008). "New Gulfstream, p. 52". Flying Magazine. 135 (5): 52–57. Retrieved July 7, 2012. ... sidesticks don't provide visual feedback and actually don't move much at all as they respond to the pressure applied by the human pilot ... in the G650 when you grab the yoke and move it, the one on the other side will respond just as it does on a conventional airplane. ^ "Fly-by-wire - A CIVIL AVIATION FIRST". Airbus / Innovation / Proven concepts / In design / Fly-by-wire. Airbus. Retrieved 6 July 2012. ^ Flying the Airbus side stick - the one with the fastest thumb wins!